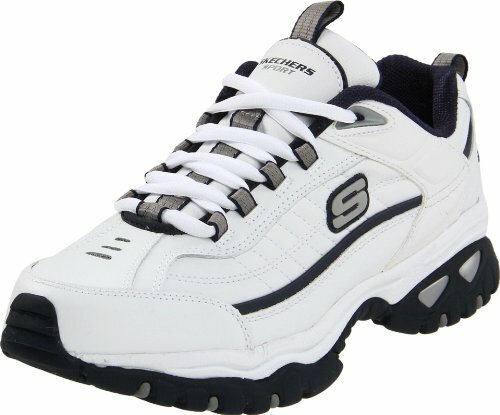 GoSale is currently price tracking the Skechers Sport Energy Afterburn Shoes. This shoes is available in 4 different colors. Review the best prices we could find (updated in real-time) and click the 'Buy It' links to see the color and size choices at each respective store. Great for sport or casual wear, these Skechers Afterburn athletic shoes give you the best of both worlds. In black/charcoal. Shoe Technologies Mesh side panels provide breathability Reinforced overlays at toe and heel Shock-absorbing midsole Removable memory foam footbed offers comfort Padded collar and tongue Shoe Construction Manmade upper Mesh lining Rubber outsole Shoe Details Lace-up closure Padded footbed Size: 9.5. Gender: Male. Age Group: Adult. Pattern: Solid. Material: Rubber/Foam/Lace. A classic sneaker gets even greater comfort with the SKECHERS After Burn Memory Fit - Reprint shoe. Smooth leather and synthetic upper in a lace up athletic sporty training sneaker with stitching, overlay and perforation detail. Memory Foam insole, shock absorbing midsole, durable rubber outsole. Soft fabric shoe lining. Memory Foam full length cushioned comfort insole. Articu-Lyte supportive shock absorbing lighter weight midsole design. Classic style 1 1/2 inch fuller athletic heel. Flexible rubber durable high traction outsole. Shop Skechers After Burn Collection here. Size: 9 M. Color: White/Navy. Gender: Male. Age Group: Adult. Skechers Mens Afterburn Black Walking Shoes Size 15 (2E) (201890) -- Like New: Open-box Return, Great Brands, Great Value! Store: RaeAnn & Becky Shoes Condition: Brand New Price: $54.99 Total Price: $54.99 Buy It from RaeAnn & Becky Shoes Want it delivered by Monday, April 29? Skechers Sport Mens Energy Afterburn Lace-Up Sneaker- Pick SZ / Color. Last updated: April 20, 2019 at 12:02 EST. Pricing information is provided by the listed merchants. GoSale.com is not responsible for the accuracy of pricing information, product information or the images provided. Product prices and availability is subject to change. Any price and availability information displayed on amazon.com or other merchants at the time of purchase will apply to the purchase of the product. As always, be sure to visit the merchant's site to review and verify product information, price, and shipping costs. GoSale.com is not responsible for the content and opinions contained in customer submitted reviews.